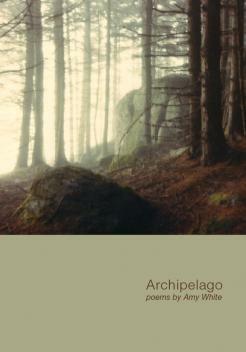 "The poems in this book were inspired by my love for my husband, Sandy White. I hope they communicate my great good fortune in having been his wife. "Two locations recur in this poems. Leadbetter Island seems constantly to float up to the surface of my imagination, arriving there first through Sandy's description of it on the night we met. A small island in Penobscot Bay belonging to the White family, it held a central place in Sandy's being, in our lives together, and it is where a small granite gravestone covers his ashes. In her professional life, Amy White taught and worked in inner-city neighborhoods, then became a political journalist and educational policy analyst. On her farm she has been a serious, if very small-time, competitive equestrian, breeder of Red Angus cattle and pugs. Mostly she's been a wife and mother, cook and scold, and is now concentrating on writing poetry. She is proud to have had a few poems published journals thus far.